Sunday 8 July – Fingle Dash 10k – 7.8 miles! Another good turnout of 24 RATs for the 2 lap, 5 mile winter handicap race around Flexbury. Despite adjustments to handicaps after the September race, several runners still managed to run significantly inside their Handicap time. So the training really works! Once again these will be suitably adjusted for the next outings. CongRATulations this time to Shelley Marshall being the first back to the Pitch & Putt Hut. While nobody returned exactly in their estimated times, our thanks go to Jo this time for finishing within 7 seconds of hers. Full results are here. Bridget Funnell 1:44:50 2nd in cat. 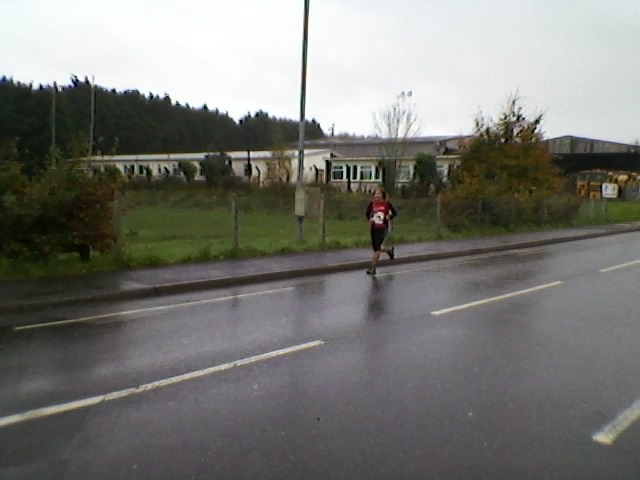 Roger Nosworthy 1:47:15 4th in cat. On a spectacular but very flooded course with many thigh deep mud and water crossings….Perfect! Jas Finney 29:30 1st Female. 1st in cat. Helen Heard 32:27 2nd Female. 1st in cat. Heidi Redman 33:01 1st U/40 2nd in cat. Sabine Maclean-Thorne 34:52 3rd in cat. Ang Martin 35:31 4th in cat. Bridget Funnell 38:27 2nd in cat. After 10 events (top 6 scores count) Bude RATs ladies have finished with 5 of the top 25 places! Katie finished 2nd in category. 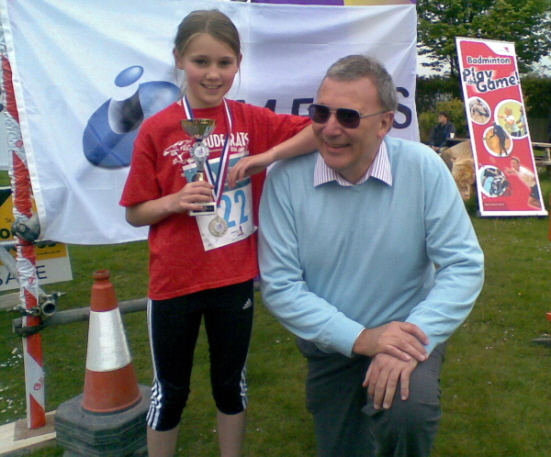 Helen finished 1st in category dropping only 2 points. Becky finished 7th in category. Ang finished joint 2nd in category only 6 points behind the category winner who had a maximum 600 points. Bridge finished 2nd in category dropping only 7 points and only 3 points behind the category winner. Bude Rats Female team finished joint 2nd dropping just 5 points and only 2 points behind the winning team, St Austell. It’s also worthy of note that Jas was only able to compete in 4 events but was the 1st female in all of them. Watch out 2013! All our ladies deserve a hearty congRATulations for their dedication throughout the series and it’s time for the men to step up and show their metal! The official calendar for 2013 isn’t available yet but will be posted on Forthcoming Events as soon as it is Final results for the series are here. A few pictures are here. After many months of hard training, RAT John Greenaway headed off to NY to run the NY city Marathon. The athletes were assured the event would go ahead despite the terrible natural disaster ‘Sandy’ that had battered New York the previous week. Huge disappointment when, a little over 36 hours hours before the start, the event was cancelled. John along with over 20,000 other determined athletes weren’t going to leave without having completed the task they were there for… So they ran 6 and a bit laps of central park to complete their very own New York Marathon. It might not have been The ‘ING’ marathon but there are many words that you could tack on in front of ING…excitING? engagING? Well done John, this was a real adventure and an event that will go down in history, a true test of self motivation, grit and determination without the help of gel/water stations and the crowd to pull you along. There was no official 2012 winner but 20 thousand plus un-official winners ….Job done! The start time was a challenge – getting up to have breakfast early enough, and to make it to Plymouth by 8.15am! But we both had a great time, really enjoyed it and are planning our next event already! CongRATulations to both of you for your first event with the RATs. Look at those smiles. What a difference a hot drink and bacon roll make! The sun always shines on the RATeous – Well it did on Saturday. It was still cold and the ground still muddy but in between the rain and the hail, the sky cleared and the sun shone for the critical hour between 11:00 and 12:00. CongRATulations to Andy for his first event with the RATs. Race very well organised, good signage to the car parking area, no queues for the ladies, very friendly encouraging marshals even in the damp & cool conditions, 2 water stops & 2 jelly baby stops! Anyway I managed to “struggle” my way round the course without stopping, except to climb a couple of styles & gingerly cross a very slippery wooden bridge. Will definitely do it again next year. Steve Martin 51:03 Paul Bowden 51:52 – 3rd in cat. Annie Finding 1:04:22 – 2nd in cat. Jas Finney 40:16 1st Female. 1st in cat. Helen (over 40) Heard 44:23 2nd in cat. After 9 events (top 6 scores count) the stage is set. In the female open category Bude RATS still hold 5 of the top 19 places! Katie Davis is now 2nd in category, but not out of danger yet! Helen Heard is now 1st in category and can’t be knocked off the top. Becky Healey is 4th in the same category as Helen with others on her heels. Ang Martin is joint 1st but with little room to manoeuvre. Bridge Funnell is 2nd in category but there’s danger looming in third place. Bude Rats Female team came 1st on the day and are now 3rd over all. A top 3 place is not guaranteed yet. The final event in the series is hosted by Mounts Bay Harriers in Penzance. Sunday 11th Nov ‘Remembrance Run’ 4.2 Mile Beach Run. start 11am. (registration from 9.30) The full calendar is available via Forthcoming Events. Full results after 9 events are here. A few pictures are here. Rob Shaw 48:53 – race winner Wayne Van Rensburg 51:46 – 2nd in cat. Andy Latter 71:12 Annie Finding 74:41 – 2nd in cat. Full results are available here. First pictures are here. A well organised event starting in the centre of Truro. The route does a short loop of the main streets then heads along the river and a cycle path through some scenic wooded and riverside areas before returning to a flat finish in the centre. Both Alex and Paul had done the race in 2011 and described it as slightly undulating – having run it again this year their opinions have been revised somewhat, but would still recommend it as a lovely route. A good turnout of 26 RATs for last nights 5 mile handicap race. Clearly there are some ‘ringers’ in the club as many runners were well inside their Handicap time. Obviously these will be suitably adjusted for the next Handicap race. CongRATulation to Loraine Jennings on being the first back to the Pitch & Putt Hut. Many thanks this time to Mica, Alex and Annie who all finished within 2 seconds of the estimated times. Full results are here. 15 hardy souls took to the hills at Sourton (and 15 made it back). Not content with being first lady and first in category, Helen also broke last years ladies course record. Full results and a run report are available here. In the female open category Bude RATS hold 5 of the top 19 places – Read on! Katie Davis (6 scores) is still 1st in category, but not out of danger yet! Becky Healey (6 scores) is 3rd in category in a hotly contested group Helen Heard (5 scores) is 4th in the same category as Becky but with a race in hand could make it to the top. Ang Martin (6 scores) is 2nd in category and on paper can still make it to the top! Bridge Funnell (6 scores) is still 1st in category but it’s not over yet. Bude Rats Female team came 2nd on the day and are now 4th over all. A top 3 place is possible with the right results in the last 2 events. The final 2 events in the series are both hosted by Mounts Bay Harriers in Penzance. 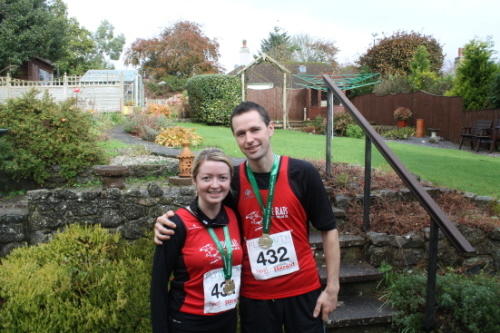 Sunday 14th Oct ‘Race for Wildlife’ 10k. Start 10.30. Enter on line, it’s expensive on the day. Sunday 11th Nov ‘Remembrance Run’ 4.2 Mile Beach Run. start 11am. (registration from 9.30) The full calendar is available via Forthcoming Events. Full results after 8 events are here. A few pictures are here. That run with us upon Saint Clether’s day. After 7 events – Ang Martin is 4th over all and 2nd in Cat. Becky Healey is 8th over all and 2nd in Cat. Katie Davis is 9th over all and 1st in Cat. Bridge Funnell 19th over all is 2nd in Cat. 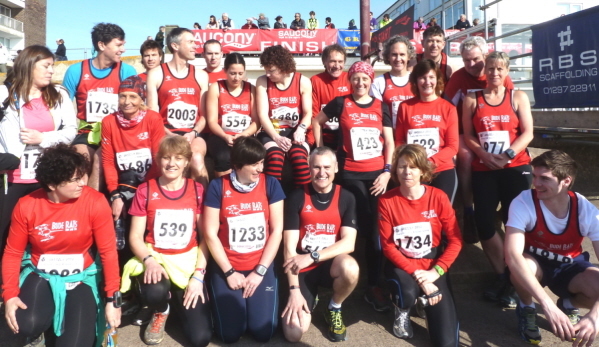 Bude Rats are also 4th Female team over all. The next event (8th) in the series is the Trelissick 10k on Saturday 25th August. The full calendar is available via Forthcoming Events. Full results after 7 events are here. Great turnout for the 5 mile Handicap Run this evening – 28 runners in total and nobody got completely lost! Congratulation to Gary Lowson on being the first back to the Pitch & Putt Hut. Many thanks to Heidi for finishing in exactly her estimated time. Full results are here. Full results for all three events are available - here. A couple of pictures from Ang with a big gap for some words are - here. Sarah Tonkin, Roger Nosworthy & Bridget Funnell, all completed the distance well within the allocated time. After 6 events – Ang Martin is 7th over all and 2nd in Cat. Becky Healey is 10th over all and 2nd in Cat. Katie Davis is 11th over all and 1st in Cat. Bridge Funnell 21st over all is 3rd in Cat. Bude Rats are also 3rd Female team over all. The next event (7th) in the series is Tywardeath Trotter 7mile on July 28th. Organisers Tywardreath + St. A. The full calendar is available via Forthcoming Events. Full results after 6 events, are here. After 5 events – Katie Davis is 13th over all and 1st in Cat. Ang Martin is 9th over all and 2nd in Cat. Becky Healey is 11th over all and 3rd in Cat. Bridge Funnell is 3rd in Cat. Bude Rats are also 3rd Female team over all. The full calendar is available via Forthcoming Events. Full results after 5 events, are here. swim 33:12. bike 1:25:59. run 43:44. 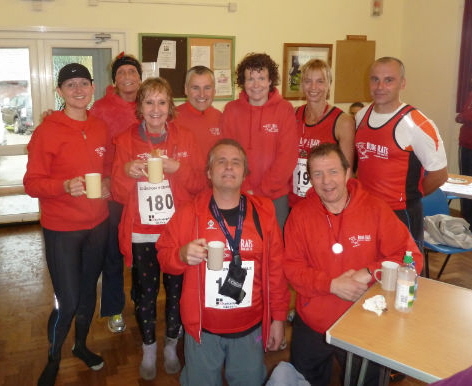 * First 10k for Bude RATs. CongRATulations to all! The Bude Rats Team came 6th on the day and is now 4th after 2 events. The next event in the series is the St. Austell Half on May 20th. The full calendar is available via Forthcoming Events. 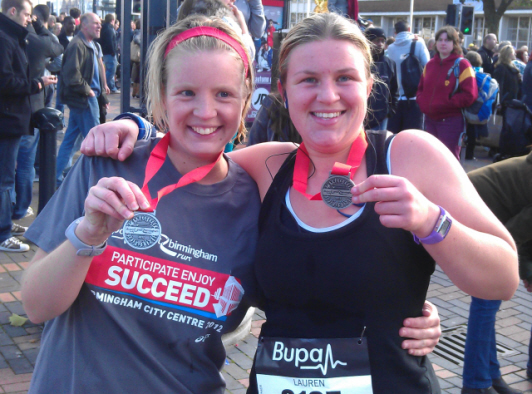 Rowena writes… The Great West Run was lovely for me – I was a spectator! The stadium start and finish really made it feel like a professional event and was a great place to see/photograph people start and come in, in the comfort of the stand, or the grass. Toby said the feel of the track beneath trainers was a real boost to running that last lap too. It was a lovely sunny day and we weren’t sure how many RATs were there, but I cheered as I saw 3 come in about 3 minutes apart. Apparently the course turned out to be a bit more hilly than Toby expected and although there were plenty of facilities and it was well organised there, be sure to arrive in plenty of time if you go next year because the parking was a nightmare – all the roads that you need to get into the area are shut for the race! It’s time to spill the beans Alex – How did Mark beat you ? Late news has come in confirming that several RATs were seen competing in the Sainsbury’s Sport Relief Mile events. There are no official times but we understand that Liz Wilson won the ladies 6 mile race and that Terri, Hayley and Ian all competed in the 1 mile race. Further rumours are that Ian has claimed the winning time of 5mins 34secs after knocking a few mums and toddlers into the canal to get them out of his way! However rumour also has it that Ian took ten minutes to get to the front – go figure! Alex Hutcheson & Susan Van Rensberg. After a promising first half, Alex and Susan made it to mile 18 in about 4hrs 40 mins before they had to withdraw for medical reasons. Sabine writes….After a festive period of eating a lot and some not so routine training, running a ‘fast’ 10k in early January is a little daunting. However the course was flat and took you along the canal and quay which was pleasant scenery. There were also many supportive spectators cheering you on all along the route. The race involved running around a loop of about 3k twice and the distances were clearly marked which enabled you to pace your run well for a good time.